How do you recognize when you are ready to start investing? Great question! The answer is simple, you are never too young to start investing for your future. Now, "investing" and "playing" with your money are two different things. It would be a great idea to develop a long-term investment strategy and start putting money away. Unless you have a great deal of knowledge about the markets, you should not "play" with your money. Take a peak at some scenarios where you make a monthly deposit with annual compounding of interest at 7% at the end of each year. $25 per month would be $30,321.91 at the end of 30 years. $100 per month would be $121,287.65 at the end of 30 years. $1000 per month would be $1,212,876.50 at the end of 30 years. As you can see, even small amounts invested for the long-term can become a nice little nest egg! I hope this helps. If you still have questions, contact a fee-only financial planner. Of course, fees are not the only reason to consolidate. The investments themselves may need some attention. The biggest concern for your portfolio may be overlap and the concentration of your dollars to certain asset classes. You may be way overweight in US Large Cap stocks, which is a common issue for folks with multiple retirement plans and mutual funds. This over concentration could affect your returns as well as your risk profile. Lastly, if you are self-managing your investments at this point and you are spending too much time or are starting to have more questions about what retirement is going to look like from a draw down perspective, it may be time to consider hiring an advisor to help get you to and through retirement. There are many advisors that are fiduciaries, that do not sell products, that can truly help you and may be able to reduce your fees even further. I hope this is of some help. If you still have questions, consult with a fee-only financial planner. Am I entitled to any of the growth in my ex husband's IRA? This is a great question. Retirement assets are split through a process called a Qualified Domestic Relations Order, or QDRO for short. This order will determine what assets should be delegated to the parties involved. However, it really comes down to your individual situation and what is set forth in the divorce decree. With that being said, you are typically entitled to half of the total balance, both pricipal and growth, that was accumulated during your marriage. Most states defer to a 50/50 split of assets between spouses during a divorce. Keep in mind any contributions and growth accumulated prior to marriage is left out of any of the calculations, unless otherwise determined by the decree. One of the unique traits to assets divided by QDRO is the accessibility without penalty. Typically, if you are not age 59 1/2 and take a withdrawal from a retirement account, you will be penalized 10% of your withdrawal. In the case of QDRO, the penalty is waived. A divorce attorney should be able to tell you the specifics of you situation and walk you through the state's requirements for assets in case of divorce. Hope this is of help! If you have any other financial questions, consult a fee-only financial planner. What's the best way for a 20 year old to invest $5,000? This is a great question! The best place to put your money depends on a lot of different factors. If you have any debts that have interest rates in excess of 10%, you should highly consider paying them off. This is the easiest way for you to earn a guaranteed rate of return. If you are debt free, you may want to start investing in a retirement account. If you are employed and your employer is offering you a match, then you should contribute at least enough to get your full match. If they do not offer a match, then you may want to fund an IRA. However, if you are planning on needing the money at age 35, then a retirement account would not be a great option due to penalties and taxes. A brokerage account is always an option if you are needing access. As you can see, we really need more information about your situation to know what is best. Generally, I would say a diversified portfolio of stock-based ETFs would be a great start to put your money to work. I hope this helps! If you still have questions about your situation, talk to a fee-only financial planner. This day and age it is becoming more common to work with a financial professional, remotely, utilizing technology to connect from anywhere in the world. This may be a value-add for a young professional that enjoys travelling frequently or one that is not tied down to any one location or city. Starting a relationship with an advisor that can work with you from anywhere will allow for a continuous relationship no matter the changes in your life. 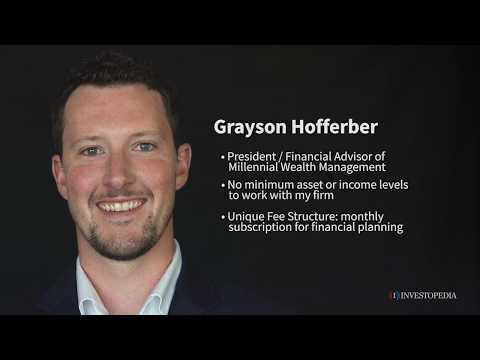 I am a member of the XY Planning Network, which is committed to serving the needs of the next generation of investors, and you can find a professional to work with by clicking here. The advisors on the network are all fiduciaries, putting your best interests first, and do not sell any products or earn any commisions, thus, avoiding any conflicts of interest.